What Would it Take to Close the Opportunity Gap? TAGBoston is cosponsoring an event presented by the Latin American Law Students Association on the issue of closing the opportunity gap. The event will feature three prominent legal and educations scholars as well as prominent local respondents who will discuss the implications of the presentation for policy in Massachusetts and contemplate the possible challenges policymakers may face in implementing such reforms. 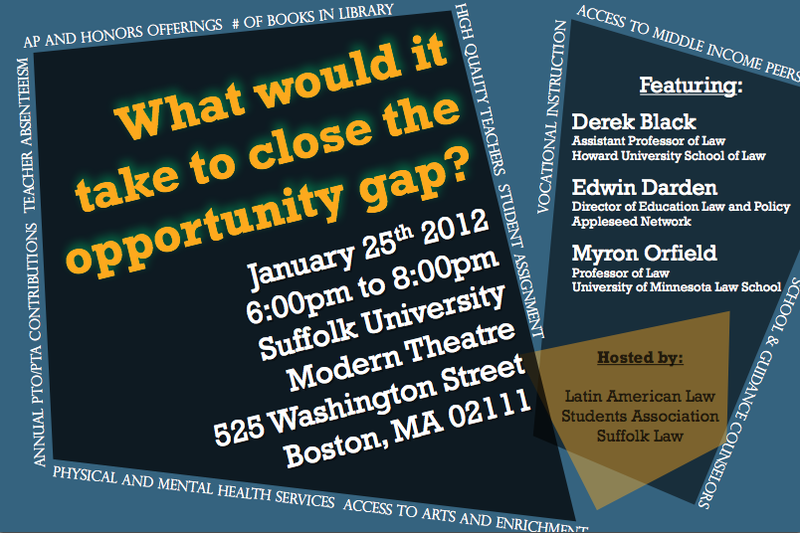 Event Name: What Would it Take to Close the Opportunity Gap? The discussion draws principally on the recent work of Edwin Darden (Director of Law and Policy, The Appleseed Network) and Derek Black (Professor, Howard University School of Law). Both of these civil rights scholars recently developed different, but complementary, frameworks for assessing access to what Darden’s organization terms “learning-related education resources.” Such resources profoundly affect the quality and effectiveness of education, are usually distributed by a school board’s approval, but are not “dollars” per se (i.e. curricula, qualified and motivated teachers, and building upgrades.) Appleseed’s research finds that school boards often make one-at-a-time decisions that, over years and decades, exacerbate resource disparities between schools in their districts. The Appleseed Network designed the Resource Equity Assessment Document (READ) as a tool in identifying and correcting disparities in learning-related education resources.Meanwhile, Professor Derek Black’s most recent scholarship “revealed a serious problem with racially unequal access to middle income peers within districts that stretches across all states.” Given the documented benefits associated with access to middle income peers, Black argues for a constitutional right to equal access to middle income peers. The third presenter, Myron Orfield (Professor, University of Minnesota School of Law) will discuss the READ tool and its implications on school board decision-making within the context of student assignment (an issue that is not explicitly addressed by the READ tool). He will explore the modern-day implications of the Supreme Court’s 1973 decision in Keyes v. School District No. 1, which was an important legal precedent in the Boston desegregation case (during which issues of “intent” were passionately debated). Three respondents will discuss the implications of the presentation for policy in Massachusetts and contemplate the possible challenges policymakers may face in implementing such reforms. Respondents Donna Bivens (Director, Boston Busing and Desegregation Project at the Union of Minority Neighborhoods), and Mariana Arcaya (Public Health Manager at MAPC, providing public health expertise, statistical analysis, and program evaluation support) will discuss the implications of the presentation for policy in Massachusetts and contemplate the possible challenges policymakers may face in implementing such reforms.